Welcome to the tenth edition of our series of short interviews affectionately titled Talking Shop. The majority of media and fan attention gets showered on the artists who create the music we love to listen to/DJ with/dance to, and for good reasons. But without the hard work, keen ears and business savvy of label staff, we’d be stuck only streaming tracks on Myspace. Number ten brings us to the cold and soulful sounds of Berlin’s Workshop. Headed by Jens Kuhn, known to many as Lowtec, Workshop is as much a label as it is a series of EPs. Since 2006, Lowtec and crew have put out a new EP every few months, each comprising three untitled tracks. Some showcase a single artist (Move D, Kassem Mosse and Lowtec have each commandeered one), while others feature a handful at once. LWE’s current favorite is Workshop 004, a collection of shadowy house tracks by Move D, Even Tuell and Sascha Dive. With its gray aesthetic and cryptic design, Workshop has chiseled a distinct identity and landed a distribution deal with Hard Wax, arguably Berlin’s most respected record shop. Lowtec gives us the lowdown on the snacks that inspired the label’s creation, their stratified demo system, and how smaller release runs could save the vinyl business. Also, an exclusive mix from Even Tuell inaugurates our Talking Shopcast series after the jump. Please tell me about the beginning of Workshop. Why and how did you start out? How did you decide on the name Workshop? It took us two bottles of wine to decide that Workshop would fit best because it expresses the way we talk about, deal with, and make decisions about the music we produce and receive as demos. We take our time with the Who/Why/What/When decisions. That’s what you learn from experience with fresh cheese and good Bordeaux. Can you tell us a bit about why the tracks are all untitled? Searching a good track name for “just-another-cool-dancetrack-or-DJ-tool” might seem a bit senseless or like a waste of time but sometimes track names fit so well that some artists skip that rule. How do you select the artists for Workshop’s roster? It’s mainly about good old friends and keeping the family together, but it also features relative newcomers like Gunnar, Kassem Mosse, or Sascha [Dive], which is the result of traveling around and keeping your eyes, and of course ears, open for fresh but familiar sounds. We love Kassem’s record because it’s very special to us. We were kind of worried whether it would be recognized for its new-schoolish groove and its experimental slo-motion tempo. Workshop: Keeping the rubber stamp industry booming. According to many doomsayers, running a record label isn’t one of the “smartest” fiscal things to do. How do you keep Workshop running with sales “as they are”? Hardwax does a very good job for our label and we’re very happy to work with them as our exclusive vinyl distributor. It seems easy for them to sell the stuff they like and if they don’t like a release very much, they’re honest about their view and advise or suggest lower production numbers to reduce the financial risk for the label. Definitely not and definitely yes. As long as it doesn’t feel like self-hyping or remote controlled hyping, remote controlled hyper PR or marketing of rubbish that there’s no adequate rubbish marketplace for… we think all this blogging is very fine and informative! There is no shortage of labels in dance music. 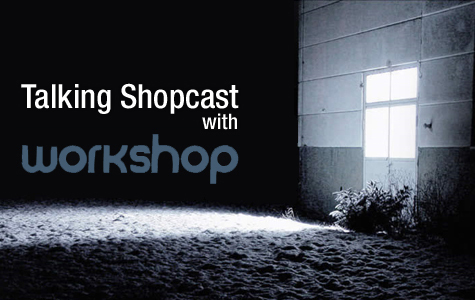 What does Workshop do to stand out from the crowd? 1st. We do what we love, like all the others hopefully do as well. 2nd. Maybe all the little underground labels should rethink their output frequency a bit. If they want they can contact Natascha 24/7 to learn how to handle it. As technology advances further, vinyl is moving closer to becoming obsolete to many DJs. What are your feelings on this? Do you think the end of vinyl is in sight? Vinyl will never die and it will definitely kill the mp3 industry, which we’re very sorry for. 😉 Mp3s cause a lot of messiness in one’s music collection. Vinyl does too, but it really feels better and it weighs a lot more. 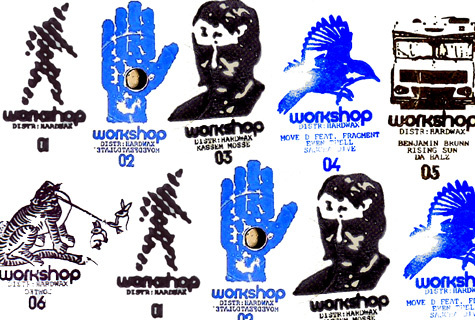 Warp, Rephlex, Main Street Records, Source Records Heidelberg, Trax Records, Dance Mania, Dow & Vigliante, and the early years of Playhouse and Planet E.
What can we expect from Workshop in the next year or so? Hopefully some very good EPs and a little Workshop showcase tour. To get an aural idea of what Workshop’s all about, check out this exclusive new mix by Even Tuell. Some of you may know this Workshop gun already as the man behind the ghostly second track on Ame’s Fabric 42 mix. Entitled “DETROITENACHT,” this mix represents Workshop well — a serene variety of deep and soulful sounds, perfect for the descending autumn. Thanks for this super-necessary text on one of the most charming labels out there. One of my favourite labels, the new Lowtec is fantastic. The mix is really beautiful. Like the label also. Thanks! and I like this LWE- site very much!! great mix, really very much into the slow, late night vibe. thanks a lot. oh I think I have a new favourite label … I like the two tunes you’ve streamed a lot! and I’m looking forward to hearing the mix. thanks everyone. thx for this documentation. nice to get more background info from the ppl behind. also thank you for the music _ every record is like a workshop by its own _ listen carefully, learn more! keep on lovin ur way! I like the two tunes you’ve streamed a lot! and I’m looking forward to hearing the mix. have already been visiting ur website around several days. really enjoy your posts. by the way i am doing a study relating to this issue. do you know any other great sites or perhaps online forums where I might get more info? thanks a lot. great post.Thanks and wish all the best.Will be back soon.